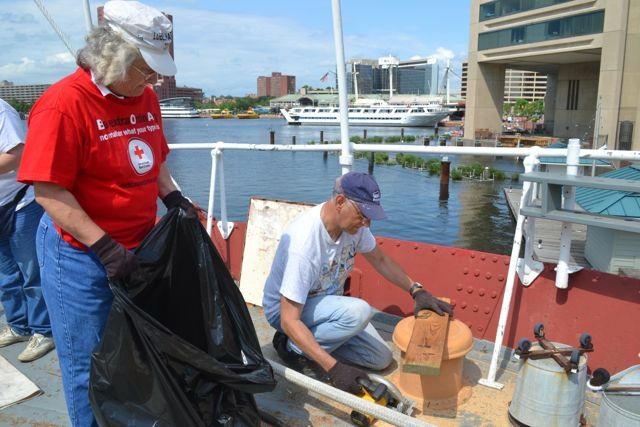 Workday: Historic Ships in Baltimore June 6, 2015 – Chesapeake Chapter U.S.L.H.S. Our June workday on the lightship Chesapeake was a busy one. A dozen volunteers spread out to all the little nooks and crannies of the ship – and there are lots of those. We worked from the fly bridge to the lower deck workshops and from the wardroom to the fidley. There was an interesting mix of people this time – not all Chapter members. The student volunteer who was there on our last visit was back again. 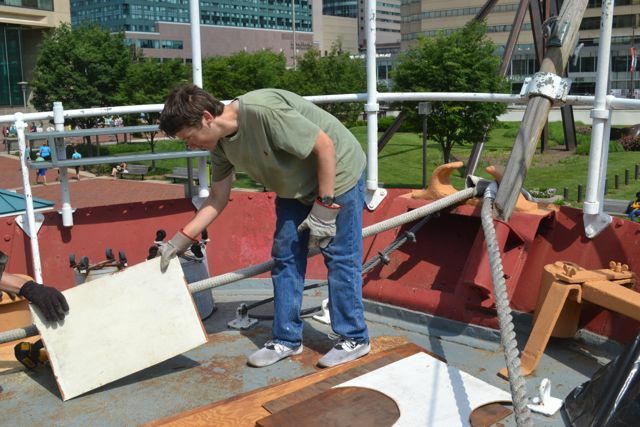 He’s completed the hours needed for his school credit, but apparently he enjoys it and has kept returning to work with Greg on restoration of the treasured lightship. 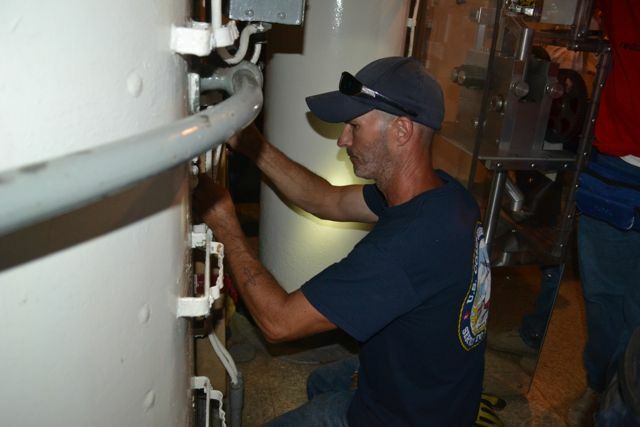 There is also another gentleman who has served in the Merchant Marine and is well versed in the electrical needs of a ship. 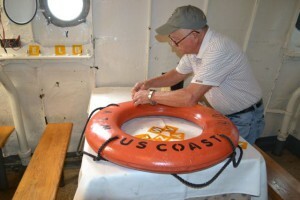 He met Greg while on a tour and has since volunteered his time to the museum. There were also two other volunteers, one who had a more personal connection with the ship. Her father served aboard the Chesapeake. She recruited another volunteer and they touched up the paint in the wardroom. 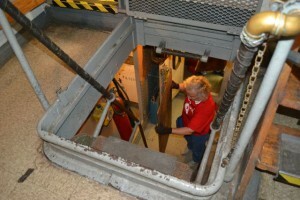 Lauren hauling wood from drill press room to upper deck. A lot of old wood stored below in the drill press room was hauled up onto the deck, cut up and disposed of. We painted a couple of ship’s dark covers. 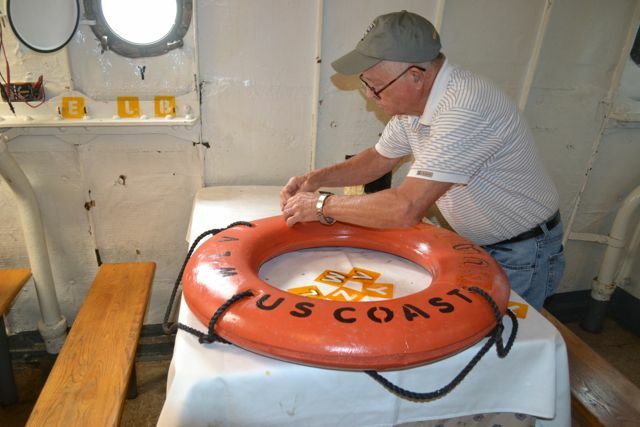 The life ring was meticulously stenciled with the original designation for the ship. The light that accompanies the life ring was scraped and painted with international orange. Some of the old wiring was pulled to make way for replacements. 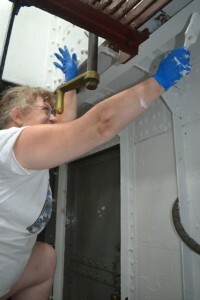 The brackets in the fidley were given a second coat of paint prior to the re-wiring that needs to be done. The fly bridge binnacle was cleaned, but we didn’t have the proper silicone to help reseal it. All this rain we’ve been having is leaking into the binnacle so it needs to have the silicone replaced. 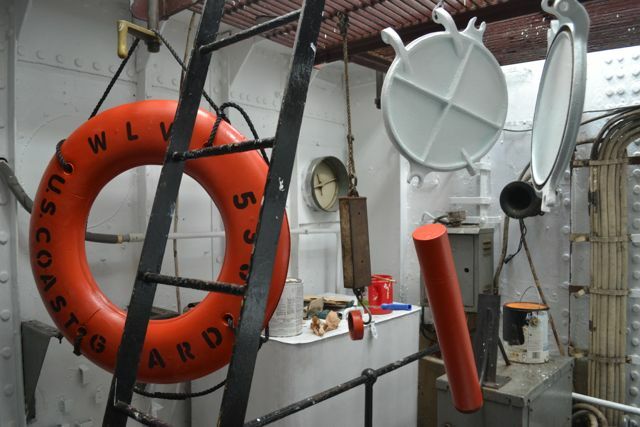 Some of the brackets in the wardroom were given a coat of green paint. The cooks cabin was thoroughly scraped. Rob (the museum representative we work with on our volunteer days) will give it a coat of paint now that is has a clean surface to work with. We also cleaned a signal light that Greg will reassemble it with parts from another light with a more complete mechanism. There were several other electrical tasks completed and I’m sure I’ve left off a couple of other items. It was hard to keep track of all the activity! Andy scrapes chipped paint in cooks cabin. If you haven’t been to the lightship lately, you should be sure to visit the next time you’re down in the harbor. 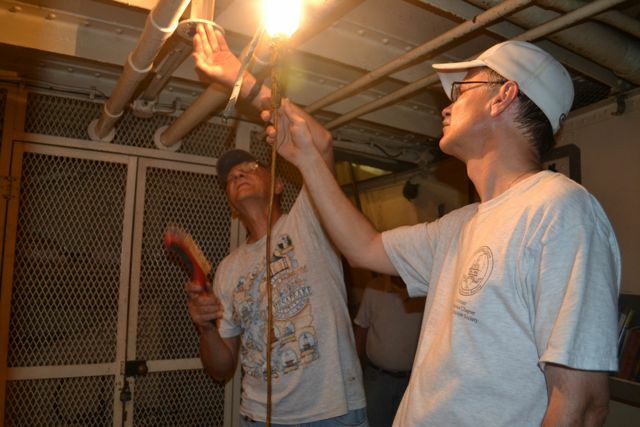 Many of the improvements aren’t readily apparent, but the electrical work is needed and is slowly taking place. As volunteers we’ve seen many areas the public can’t go – so if you want that extra treat, join us for a volunteer work day. The dates are on the calendar. 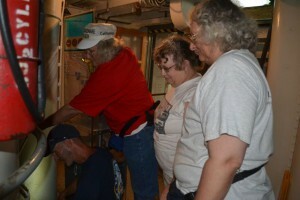 But you must be a member to volunteers and see what’s behind the closed doors! Heidi painting brackets in Fidley. 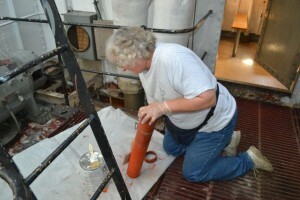 Paula scraping the life ring light prior to painting. Aiden hands board to Tony so he can cut it up. Tony and Lauren cut up wood and bag it. 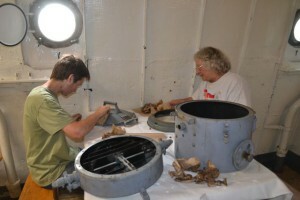 Paula and Aiden cleaning signal light. 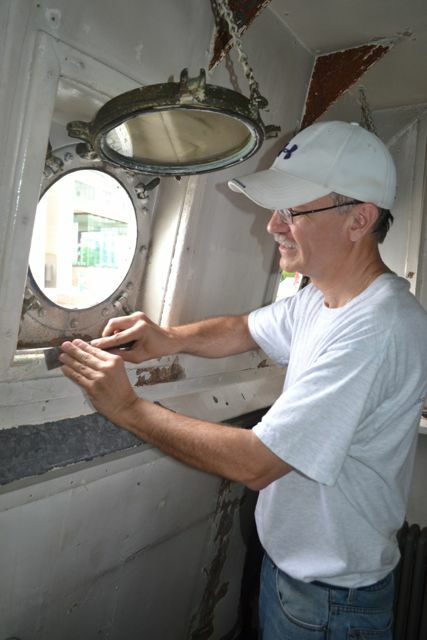 Andy and Tony below decks scraping more chipped paint. Lauren, Heidi and Paula getting tips from Rob – or are they supervising??? Hanging art…well actually its the light and ship dark covers and life ring drying in the fidley.